Honor their sacrifice. Support a wounded warrior today. You’re just a click away from honoring and empowering Wounded Warriors through WWP’s Advance Guard. Please join us with your monthly pledge today! *Please allow 4 – 6 weeks for delivery of your blanket. Other WWP items will be delivered to you throughout the year. able to make a monthly commitment. Yes, I would like to receive communications from WWP with updates on warriors & programs. Note: Wounded Warrior Project does not disclose the donation amount. For mail cards, you can order 1 card per $10 donated using the dropdown below. You will receive all of the cards to your address for personalization. 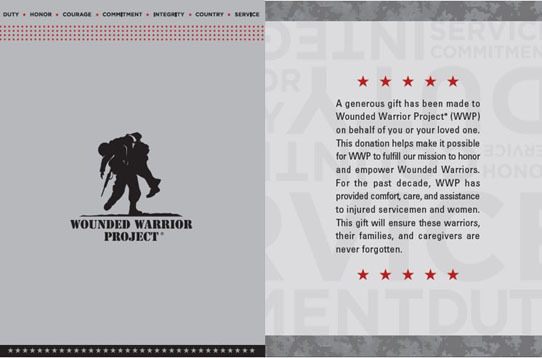 Wounded Warrior Project is unable to personalize the cards and mail to separate addresses. I would like to order mail cards, to be sent to my mailing address above. For printable cards, you will receive an email confirmation with a link to a page where you can download and print a card to tell your friends and family that you have honored them with a gift to Wounded Warrior Project. You can just print and fold these cards, and they are ready for your recipient! A donation receipt will be mailed to the email address you provided.